Back in June I travelled to Dublin to speak at the Dublin Cycling Campaign Conference which had a special focus on gender issues. Most of the day we were intensely discussing the politics of cycling in all its forms, but just before lunch all us policy wonks stood down and we were introduced to a tiny Irish woman who could hardly see over the lectern. 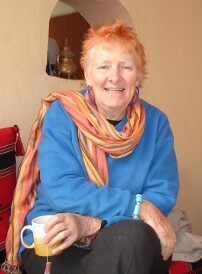 The sparkling eyes and the streak of pink die in her grey hair suggested a feisty character and this was quickly confirmed when she began to tell some anecdotes from her 2011 book “My home is your home, A journey round Syria”. Highly topical in some sense because of the increasing gravity of the situation in Syria but she entertained us by talking about her travels and her attitude to cycling. It was the perfect antidote to the seriousness of the rest of the day and she had the room smiling and laughing as we finished our morning. I was therefore especially pleased when Damien O Tuama the conference organiser gave me a signed copy of the book as a thank you for coming. I actually read it ages ago and have had the blog post stored up in my head for most of the summer, but as I have confessed on my library page I do find it hard to squeeze the reviews into the blog. Sadly however Syria has remained more than topical all summer, something that Mary alluded to when she spoke. The book itself isn’t a cycling book in the way that other writers use travelling by bike to guide their narrative. Mary Russell is much more a cyclist who happens to use and enjoy a bike as transport when it suits, but equally uses taxis, buses and camels to get around. The two things that shine through the book are Mary’s enthusiasm for the people of Syria and her determination to bring the history of Syria’s culture to life by visiting the towns and buildings that feature in the stories of historical figures. So we learn about poet Abu ‘ala Ma’Ma’arri whose work is thought to inspire Dante and a bike ride round Tadmor is an excuse to learn about Zenobia, Queen of the Syrian Desert, or rather as Mary concludes in her delightfully down to earth manner “the Maggie Thatcher of her day”. I guess it is the insularity of my English education that almost none of the figures she writes about were familiar except for cliches in the murderous crusades of medieval times. What the book does is seek out museums, homes, mosques and sites associated with these figures, some of them almost unknown in the towns that host their historical legacy so Mary is forced to become a detective in almost every city to find her characters. We even have a romantic heroine in Jane Digby, scandalous figure of 19th Century court life in England, Bavaria and other countries who at 47 finds the love of her life Sheikh Abdul Medjuel El Misrab, 17 years her junior and a nomadic chief. A visit to her former home in Damascus reduces Mary almost to tears. Mary is in turn funny, mischievous, determined and scholarly and I am sure other readers will equally enjoy the prospect of tiny feisty Mary on her travels. Such a great sadness that the only reason I now hear of these previously unknown towns and cities is as casualties mount on the news. Read this book to find out what the world is losing to this inhumanity as well as to enjoy Mary Russell’s personality. This entry was posted in Book review, Countries, Publications, Travel and tagged Book review, cycling, Dublin Cycling Campaign, Mary Russel, Syria, Touring, Visits by kevinmayne. Bookmark the permalink. Roll on the day that we can plan a cycling tour in Syria! But sadly, it won’t be coming soon, I fear.